Last month we taught you how to stretch your back properly for before and/or after your trampoline session. Stretching is an important part of exercise and recovery. 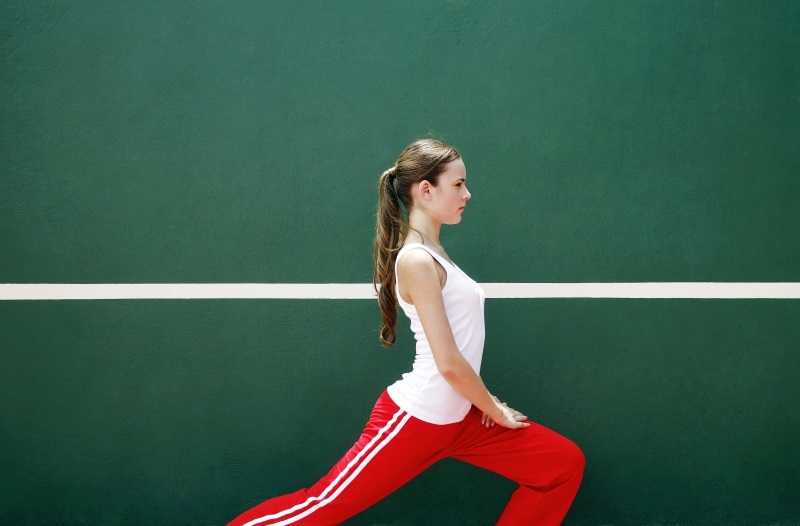 Without stretching properly, damage could be done to your body. This month we are focusing on hips and thighs. Springing up and down and up and down on a trampoline impacts your hips and thighs as your legs contact the trampoline to push back up into the air. If you suffer from pain in these areas (or want to avoid any pain in these areas) of your body, follow this simple stretch. Stand upright with correct posture and place your feet around two shoulder widths apart. Rotate your feet and body to the right so your right leg is in front of your left. Bend your right leg until your thigh is parallel to the ground. Slowly lower your body whilst keeping your back straight. Tip: if you place your hands on your hips and look straight forward you can help your balance. Slowly lift yourself up so both legs are straight. Rotate your body so your left leg is now in front and your right leg is behind. Repeat stretch on the left side. You should feel the stretch through the front of your back thigh and through the front leg hamstring. This will open your hips as well as stretching those important thigh muscles. This will help with pain and with avoiding injury. If you have any ongoing pain or injuries, please see your doctor. Topline Trampolines is a home-grown, Australian manufacturer of durable, professional-grade trampolines. Browse our range of products online, or visit our warehouse on the Gold Coast to talk to an expert.